What design tactics do you use for a newly acquired business that wants to bring their site into the current century? In many ways, revamping an outdated website can include more work than starting from scratch. However, working with the right team, CV Travel was able to cruise into the current year without hitting any snags. 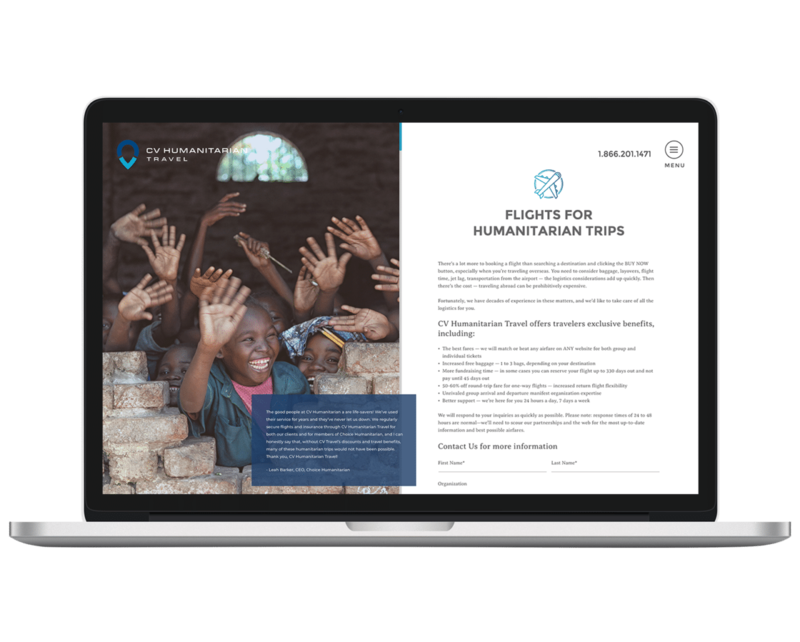 Working hand-in-hand with the CV Travel team, our designers broadened their services so that they hit every segment of the humanitarian travel industry. Using those services as our primary focus, our team created a clear and concise design that made the user journey easy to follow. From unique scrolling features to top-of-the-fold content, the entire site reflects their brand message—travel simplified. Page flip features and full-screen designs keep the user’s focus at its peak. A modern aesthetic pulls everything together for an overall simplified design. Putting the most important messages on top helps push users further down the line.